Last week was chocolate. This week it’s lemon. A highlight of my week is fast becoming Tuesdays with Dorie! And lemon tart is a favorite in our home! Given that I live in Canada and Meyer lemons don’t grow on trees up here (at least not outside in the frigid winters we have), I thought I would forgo the 100-mile diet and try to get some Meyer lemons to test this recipe a bit. I was able to find some beautiful Meyer lemons shipped here from California, land of milk and honey, or at least Meyer lemons and other yummy fruit. I wanted to do a taste test with regular lemons and Meyer lemons to see which lemon tart we liked best. Meyer lemons are a cross between a traditional lemon and an orange, possibly a mandarin. It was introduced to the United States by “agriculture explorer” Frank Meyer. How do you go about getting a job as an “agriculture explorer”, I wonder? Meyer lemons are smaller, rounder, and have a more orange-y, less tart flavor. 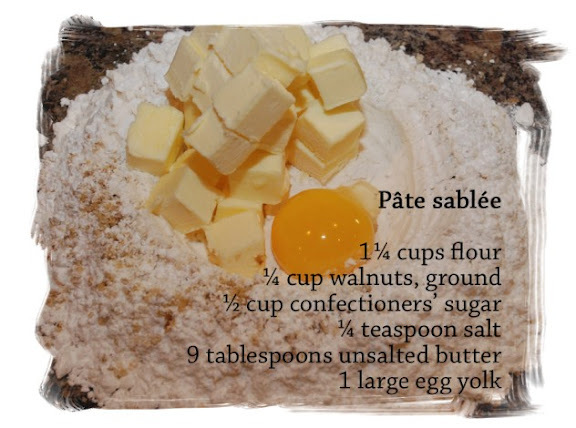 For the crust, I thought I’d try the pâte sablée with walnuts from Dorie’s cookbook. The combination of the slightly bitter walnuts with the citrus of lemon and the sweetness of the tart sounded too good to pass up. I was not disappointed. The crunch of the cookie-crust held up well as finger food even. The dough was dry at first, but I added a few fingertips of water to bring it together, and it rolled out fine. One tip I’ve gleaned from all my research is to roll the dough out onto the removable base of the tart pan. Then, replace the rim and pinch the dough up the sides. That way, you know how large the pastry needs to be for your tart or pie pan. I had some fun with garnishes for this recipe. I melted some leftover couverture chocolate from last week’s Tuesdays with Dorie and made chocolate hearts. I also made some citrus rinds steeped in syrup. First I boiled 1 cup sugar and 1 cup water until the sugar was melted. Then, I added slices of lemons, Meyer lemons, and kumquats, and a vanilla bean split open and scraped. I gently boiled this mixture for a bit, and then let it steep for 4 hours and refrigerated it until I was ready to use it. Not only do they look good, but they taste delicious. 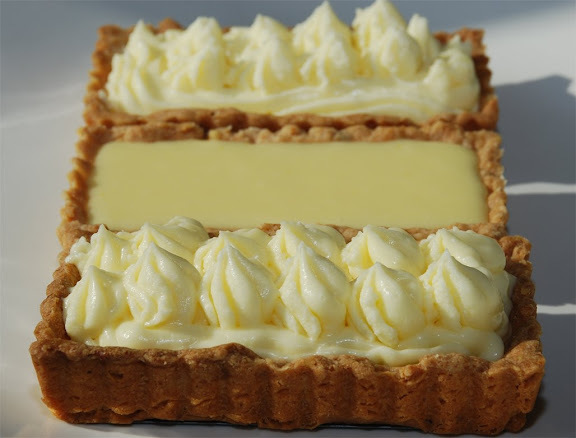 You can find the recipe for The Most Extraordinary French Lemon Cream Tart at this blog (Starting from Scratch) or in the book Baking: From My Home to Yours by Dorie Greenspan. To see how the rest of the TWD group fared with this week's recipe, click here and then click on each blogger! First, in a stainless steel sauce pan, I whisked the eggs, lemon juice, water, salt, pepper, and cayenne pepper over medium heat until it came to 180°F. At around 160°F I quickly pulled it off the heat since it looked like it was about to curdle. But I bravely put it back on the heat and whisked madly so that it wouldn’t curdle. The second it hit 180°F, I quickly poured it into the food processor (since my blender broke during the making of the lemon tarts!) and let it cool a bit. Then I added the butter in chunks, and just like that I had a beautiful, creamy, emulsified Hollandaise sauce. Easy as pie! This tart is amazing. I preferred the sweetness and orange hint of the Meyer lemon tart, but others liked the more citrus lemon flavor of the traditional lemon tart. The Meyer lemon curd was less firm than the regular lemon curd, which had a texture similar to butter. Although it didn’t take away from the taste, I’m wondering why the Meyer lemon curd didn’t get as firm. If anyone has some ideas about why, let me know. Does it have something to do with the pectin levels in each? After spending the night in the refrigerator, the Meyer lemon curd was a firm consistency, however. This is definitely a keeper recipe, in any case. 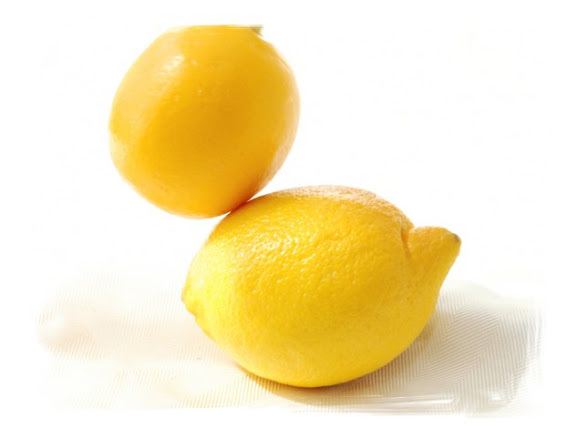 In my reading, I found this great article about Meyer lemons called "What do you do with a Meyer lemon? Here is a list of 100 things!" I'm sure some of these things could be applied to the regular lemon as well. Enjoy! Ohhhhhhh, lovely! You have such an eye for presentation. These tarts are gorgeous. I love that your posts always teach me so much! Lovely decoration ideas! Wow, beautiful tarts! And thanks for explaining the differences between lemons, I've been wondering about them! Your tarts turned out lovely! I love all the different ways you presented them. I chose to make the orange version and was pleased with it as well, even if it didn't turn out exactly as I had envisioned! Very pretty, indeed. Your Meyer/Traditional lemon comparison was really interesting. Meyer lemons went into my filling, which was rather thin--but it thickened up nicely in the end. Loved the shape, too! Your tarts are really beautiful. I love that shape. Your garnishes are perfect as well. Thanks for the great comparison of the two types of lemon. Nothing beats side by side comparisons like that. beautiful pictures! thanks for the informative post...your tarts look delicious. I love meyer lemons and have been using them in a lot of my cooking lately too. This tart however is absolutely gorgeous! Nice job. Great post and photos. 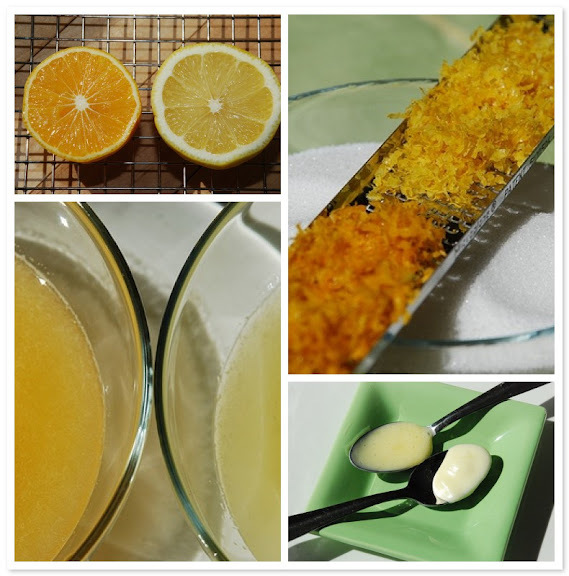 Awesome presentation of recipe, and lemon comparison! Your tarts are really beautiful. I used Meyer lemons as well (2 trees in the backyard) and my lemon cream was nice and thick the whole time, so I'm not sure why some fillings were thinner. These look totally divine. Absolutely beautiful job. Especially the pastry. I tried that pastry last week and failed, but no one in my family has the right touch to make pastry!! Looks wonderful! Your pictures are truly gorgeous. I love, love, love your pictures! Your tarts look perfect! Wow, just gorgeous. I dont even know if I would want to eat it because it is so beautiful. Okay so of course I would eat it, its lemon... te he he. Wonderful post, skilled execution, and some fine looking tarts, well done! Beautiful job! I love the different shapes. I didn't have a tart pan so I did mine in a springform pan. I love going outside the box! First of all, beautiful tarts! Your research shows. Also, I am a big fan of meyer lemons in my lemon-y desserts. Wonderful! what magnificant looking tarts!! beautiful job! 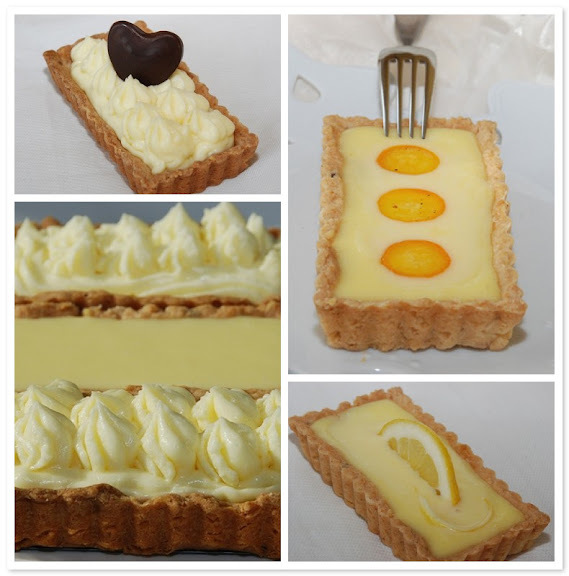 Those lemon cream tarts look so good! Nice presentations. I haven't tried a meyer lemon yet. I will have to keep keeping an eye out for them. Your presentation is just gorgeous. Love the explanation on lemons. I love your tart forms - those are fantastic, and your presentations are stunning! OH the rectangle shape is just fabulous! Lovely, lovely tarts! And I love all the info, too. I did not expect anyhting less stunning from you...they are indeed gorgeous! That lemon cream is on rotation at our house we love it so much with everything, it enhances a simple fruit salad beautifully! Oh wow, what beautiful presentation! Nice to see the comparison of the types of lemons. Those are gorgeous- great work! Wow your tarts look amazing!! I love the shape you chose to make them in, and the photos are beautiful.